The crackdown has underlined fears of a return to the violent repression of Robert Mugabe, who was ousted from power by the military 14 months ago. 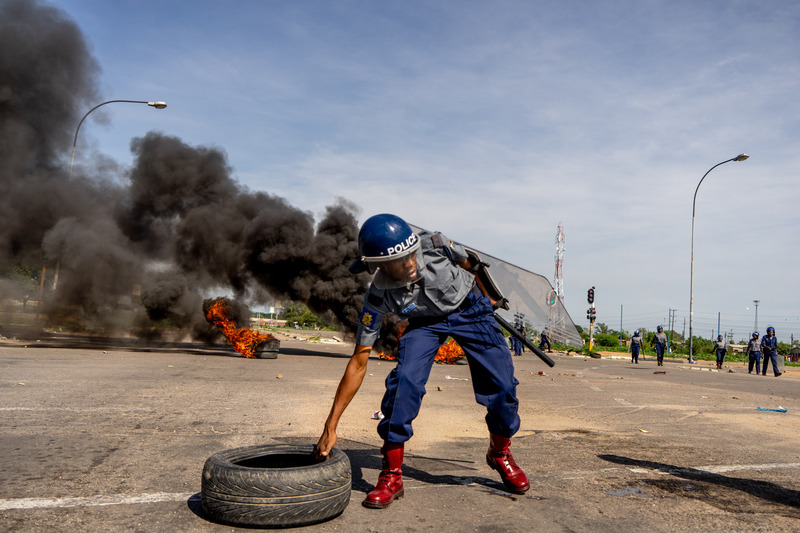 A police officer removes tyres set by protesters during a “stay-away” demonstration against the doubling of fuel prices on January 14, 2019 in Emakhandeni township, Bulawayo. HARARE – Zimbabwe’s brutal crackdown after recent protests is “just a foretaste of things to come”, the presidential spokesman told a state-run newspaper Sunday, as he blamed opposition parties for stoking unrest. The UN has fiercely criticised the government reaction to the protests as allegations mount of shootings, beatings and abductions of opposition figures, activists and ordinary residents. “The response so far is just a foretaste of things to come,” George Charamba, spokesman for President Emmerson Mnangagwa, told the Sunday News. Charamba accused MDC leader Nelson Chamisa of seeking to gain power “on the blood of the Zimbabwean people” by fuelling violent protests and trying to overturn Mnangagwa’s July election victory. About 700 people have been arrested, the internet has been temporarily shut down twice, and social media remain largely blocked. Nationwide protests erupted on January 14 after Mnangagwa announced petrol prices would more than double in a country that suffers daily shortages of banknotes, fuel, food and medicine. The United Nations human rights office on Friday urged Harare to “stop the crackdown” and voiced alarm over the security forces’ “excessive use of force” which included reports of them using live ammunition. It called on Zimbabwe’s government “to find ways of engaging with the population about their legitimate grievances”. The army and police held a joint press conference late Saturday to deny any misconduct, saying some assailants raiding homes were wearing official uniforms to pose as security personnel. Mnangagwa, 76, had pledged a fresh start for the country when he came to power in November 2017 after Mugabe was toppled after 37 years in office that were marked by authoritarian rule and economic collapse. But Zimbabweans have seen little evidence of the promised economic revival or increased political freedoms. Charamba, who was also Mugabe’s spokesman, added “the state must deal with” the MDC and trade unions, which he said had “unleashed” violence. Charamba is travelling with Mnangagwa on a tour seeking foreign investment that started in Russia on Monday. The president it to attend the Davos summit of world leaders in Switzerland this week.